Tuesday July 19th 1892 It came out very hot today. Will was over town in the morning and brought the new crumb cloth from the weavers. Mother made it before dinner. I washed the wood work in the northeast room up stairs. After dinner I put down the cloth and varnished the wood work up stairs. Will cutting hay. Wednesday July 20th 1892 I went to town early this evening. I got a few things I needed and brought old Charlie horse over for Father and Mother to go to Aunt Ems. I put on the kettle to wash. It came up a hard wind and rain. Mary Woolf and girls stopped out of the storm staying till the middle of the afternoon. Will came in from the field so he helped me wash. We were all alone at supper time. Father & Mother came at bed time. 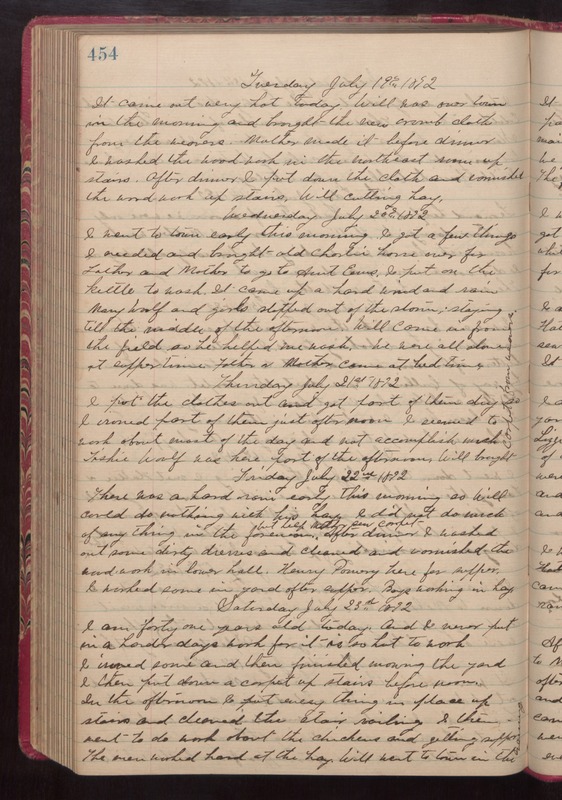 Thursday July 21st 1892 I put the clothes out and got part of them dry so I ironed part of them just after noon. I seemed to work about most of the day and not accomplish much. Tishie Woolf was here part of the afternoon. Will brought carpet from weavers. Friday July 22nd 1892 There was a hard rain early this morning so Will could do nothing with his hay. I did not do much of anything in the forenoon but help Mother sew carpet. After dinner I washed out some dirty dresses and cleaned and varnished the wood work in lower hall. Henry Pomery here for supper. I worked some in yard after supper. Boys working in hay. Saturday July 23rd 1892 I am forty one years old today. And I never put in a harder days work for it is so hot to work. I ironed some and then finished mowing the yard I then put down a carpet up stairs before noon. In the afternoon I put everything in place up stairs and cleaned the stair railing. I then went to do work about the chickens and getting supper. The men worked hard at the hay. Will went to town in the evening.